The ‘Gazprom in Eastern Russia, Entry into Asia-Pacific Markets’ press conference was held in Moscow on 8 June in the lead-up to the annual General Shareholders Meeting. The press conference featured Vitaly Markelov and Alexander Medvedev, Deputy Chairmen of the Management Committee, Vyacheslav Mikhalenko and Sergey Prozorov, Members of the Management Committee and Heads of Departments, Pavel Oderov, Head of Department, Alexander Kalinkin and Vasily Petlichenko, Deputy Heads of Departments, and Elena Burmistrova, Director General of Gazprom Export. "Construction ahead of schedule for Power of Siberia gas pipeline "
It was noted that Gazprom continued its active efforts within the projects under the Eastern Gas Programme. Particular attention at the press conference was paid to Russian gas supplies to China via the eastern route. The construction project for the Power of Siberia gas trunkline is ahead of schedule. By 2017, 445 km of its linear part were built. As of early June 2017, some 774 km were ready. Before the end of the year, it is planned to complete over 1100 km of the pipeline, which translates into about a half of Power of Siberia’s priority section stretching from the Chayandinskoye field in Yakutia to the Russian-Chinese border. In accordance with the contract signed between Gazprom and CNPC, gas supplies to China via the eastern route will start in the period from May 2019 through May 2021. In May 2017, the parties began to negotiate the exact starting dates for the said gas deliveries. Discussions continue over gas to be supplied to China via the western route and from Russia’s Far East. It was also noted that the Asia-Pacific region was a traditional LNG market for Gazprom. Between 2005 and 2016, over 75% of the Group’s LNG was shipped to the region. In 2016, the Company supplied 2.8 million t of LNG to Asia-Pacific. One of Gazprom’s top priorities is to ramp up gas sales in Asia-Pacific with the help of a third train of the LNG plant within the Sakhalin II project. It is planned to build a new production train similar to the two existing trains, with an annual capacity of up to 5.4 million t of LNG. Design documentation for the construction project is being finalised as part of FEED. 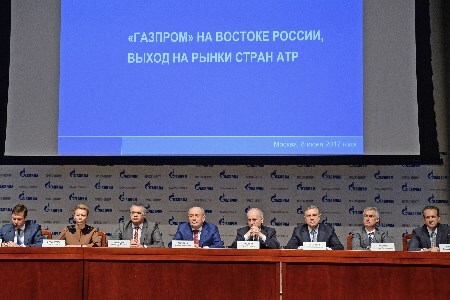 The press conference also touched upon other issues related to Gazprom's eastern projects.